One of the things I have been busy with this year is learning to be a beekeeper, along with my brother Tom and niece Rebecca. There is so much I want to say about it, but I can go on too much if I let myself. The little critters are super fascinating- and you get honey! I will be sharing some of the more interesting things from time to time, but what I want to talk about today is a tidbit that most people probably don’t think about much. 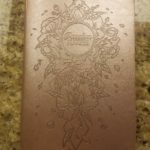 The “Dearth” is upon us! It’s pretty common knowledge that bees collect nectar from flowers and turn it into honey. They then save this honey, along with pollen, in their hives for winter food. What beekeepers learn very quickly when managing their bees is that there is a time during the height of summer- an especially long time here in the South- called the ”dearth” when there are very few flowers blooming. This means there is a severe lack of resources for bees to collect from, so they get quite creative in their foraging. A good beekeeper will have left enough honey and pollen in the hives from the spring harvest for his bees to feed them till the fall flowers begin blooming, but bees want to do what they were created to do- WORK! There’s a reason for the phrase “busy as a bee.” So what’s a busy bee to do when there are no flowers around to collect pollen and nectar from? Why, you look for the next best thing, of course! And what is in abundant supply right now is the fruit that those same bees probably pollinated in the spring! The main thing in this area that is in abundant supply right now is pears. 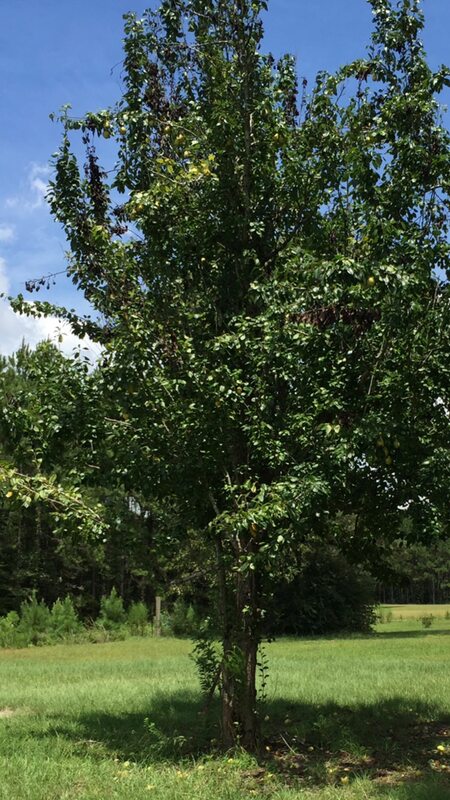 Yesterday Mom and I were collecting a bucket of them from her tree for me to take home, and we had to be careful of all the yellow jackets, native bumble bees and honey bees who were feasting on the sweet juice of the fallen fruits! 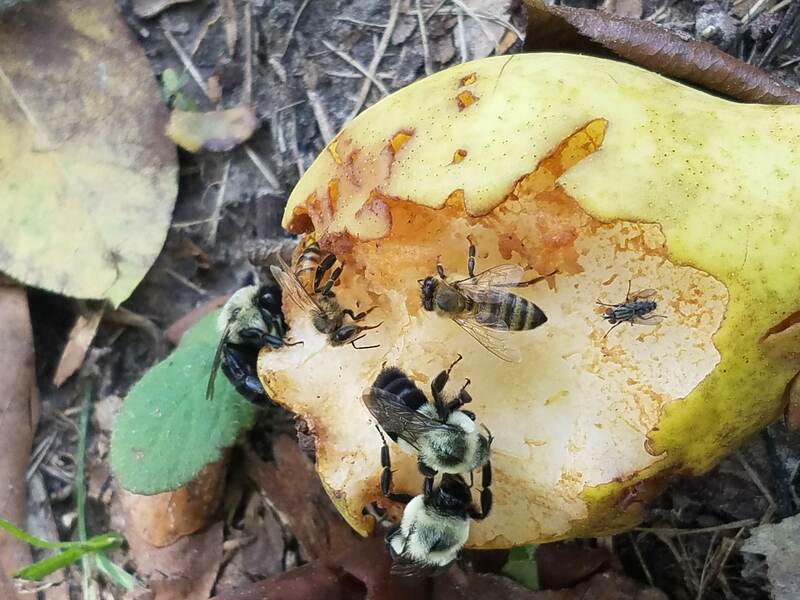 The bumblebees look so cute, but they are serious about this pear. It is the first time I can remember being aware of honey bees eating fruit. It does stand to reason, though. We feed them sugar water at times during the year to boost their growth before a honey flow or to supplement during a lean time, so sugary ripe fruit would certainly be on their menu as well. 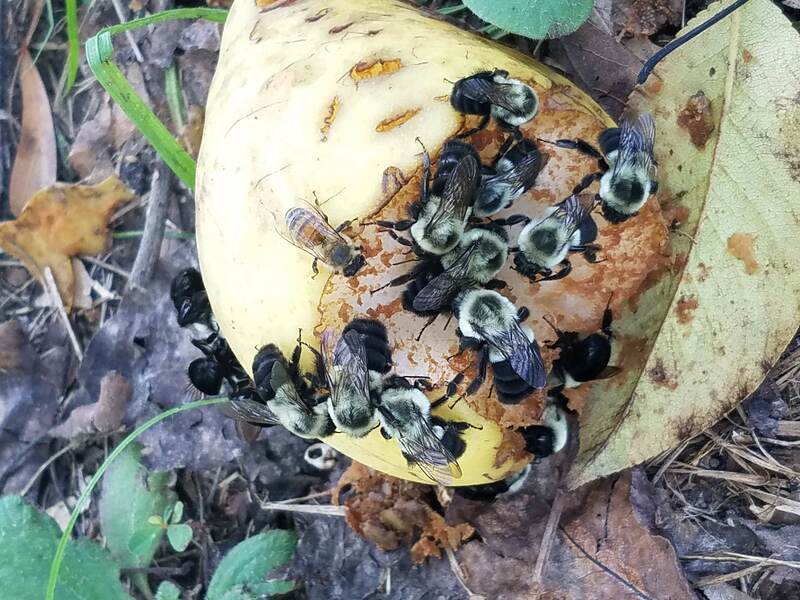 These bees are taking full advantage of the damage done to the pear by it falling from the tree (or a marauding squirrel) to get their fill of yummy pear juice! I wondered about whether they would actually store it in their combs or just use it as available. There are a couple of reports in other posts online of beekeepers who claim to have found purple honey from berries or fruit-flavored honey from other sources, so I guess it’s possible. Technically, you wouldn’t call it honey, but it was stored as food for the colony. According to the official definition, honey can only contain flower nectar and pollen. 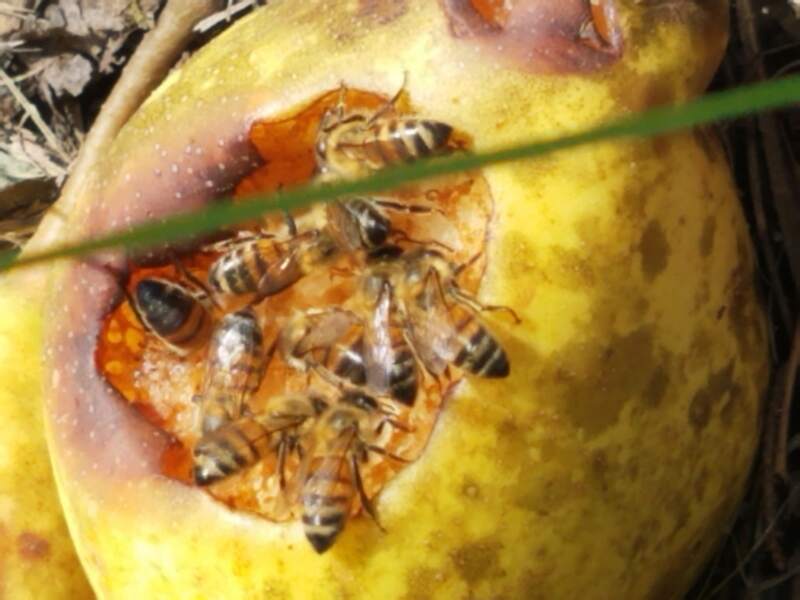 It turns out, though, that fruit juice wouldn’t do well as a primary food for the hive because it contains too much fiber and the wrong kind of enzymes for them to thrive on it by itself. Too much will cause the hive to get dysentery, which can be fatal. Another interesting thing I discovered in my research is that honey bees will actually become “drunk” from fermented substances in a manner that closely mimics humans. In fact, according to this article, http://honeybeesuite.com/one-for-the-road-bees-with-a-buzz/ scientists at the University of Ohio are studying them to learn more about how humans react to alcohol. Bees have been observed to fly into things, stumble around, and even pass out from over-consumption of fermented honey (mead) or fruit juice (wine). If a drunk bee finds her way back to the hive, she is often denied entrance because of her erratic behavior! Like I said, fascinating little critters!